The Voice Magazine Achievers Award committee on behalf of The Voice Magazine has announced the top names on their Award list for this year’s event slated for Friday 16th November 2012 at De Koning Party & Event Centre, Isolatorweg 29, Amsterdam, The Netherlands from 5.00pm prompt. 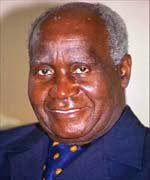 The Voice magazine is recognizing first Zambian President, Dr. Kenneth David Kaunda, a Pan-Africanist, icon of democracy in Africa as well as a forthright leader still alive today with Icon of Africa Award for his continued promotion of sustainable development and peace in the continent. It is for this reason that Dr Kaunda will be honoured for his continued fatherly role in the advancement of African continent. "Ambition never comes to an end."